Born in Maidstone in 1946. Family moved to Reading in 1947. First moved to Earley 1951. Educated at St Peters C of E, Earley. Sent to St Bartholomews Grammar school after passing 11plus. Understands bussing to school - Newbury. Parents and family moved to Sonning in 1958. David left home to get married in 1971 - lived in Bracknell until 1976, then moved to his present home in Luckmore Drive. Children both educated in Earley (St Peters and Maiden Erlegh). David is now retired, winding down after nearly 50 years of work. 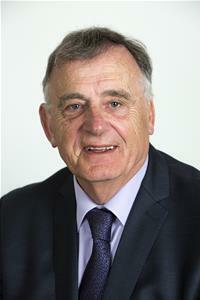 He is an Earley Councillor, first elected in 1991. A life member of Wokingham hockey club - finally retired after 41 seasons. Interests include Bridge, a little golf, charity fund raising, bird watching, walking and reading. Politics is part of my life - a chance to serve the community - it is not the most important, my family holds that place. Should I be in a position to help - with advice - I will, otherwise I will try to find out who can assist. In politics Earley is first, I will always be 2nd.